Oh I will have to check out this book. I have to admit that cover doesn't make me want to read it either. But it is great that the content is worth it. Happy Friday Braine! Thanks for visiting and following me. I'm following you back on Linky. I think a lot of judging a book by the cover- at least for me- is the time factor. I can't read the summary of every book that comes out. So unless I've heard of the book or author, I must admit that if a cover doesn't appeal to me, I mentally file it in a "Do Not Read" drawer in my mind. Until I read a few positive reviews. not a great come and read me cover. the blurb would have to be awesome for me to read it. Thanks for stopping by, my sweetlings! Happy Friday! You are soooo welcome to do that! We love ramblers! The cover is not one of the best! I probably would have skipped it but now I will check it out! Old follower! The cover looks like there wasn't much time or effort put into it. Based on the cover alone, I would probably not give this book any thought. I probably wouldn't have picked up this book either based on that cover. I'm glad to hear that the cover art has been updated, and that you enjoyed reading the book. Hmmm, not a good cover, nope. Lucky it turned out ok though!! There is not much that stands out. I'm glad that there is a better cover! New Follower. A bit odd, but interesting - the cover would likely make me want to at least check out the blurb. New follower . . . thanks for stopping by. Not liking this cover at all-there's nothing that would draw me to the book ! Thanks for stopping by and following my blog! Old Follower! Happy Friday! I kind of like the background but then the center subject just ruins it. Thanks for stopping by, following back. Actually, I think I like the cover you have up here better than the new that for 'Shadows' on Amazon! Funny how each person can have such a different reaction to a cover... that's part of what makes designing it so hard! Aww, that's not such a bad cover! oh wow it does look kind of scary though, but the bad cover things happens a lot of indie authors I think. I tend to be more understanding about that, but if they happen to well-established authors, then that just makes me cringe! Thanks for stopping by and have a great weekend, Braine! have a wonderful weekend, Braine. That one definitely is a bad cover! Eep, totally totally agree. So dark and just not...I don't know but I totally get your point! That original cover isn't too fabulous, but if the story is as good as you say it is than I'm glad there is a new one. I'll have to add this to my wishlist! Old follower. The new cover does look a lot better. I like drawn covers. I miss them. So many photographs these days! I actually like the color scheme for this cover. Tho I do agree it's nothing too special. 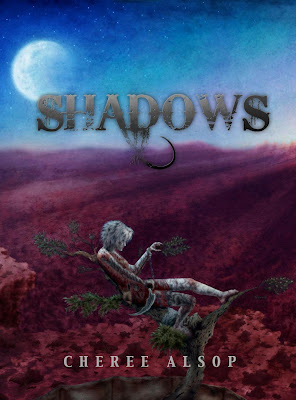 For our old followers: Thanks for the love and please check SHADOWS out, if you like fantasy & fairy tales, you'll LOVE this book. New followers: WELCOME and thank you for following back. Can't reply to each post, pressed for time but thanks for leaving comments. Much appreciated! Thanks for stopping by mine and following! You are right about that cover. I don't know what it is about it, but I just don't like it.